As usual, Delta is the first, or at least one of the first out of the box, with Q1 2019 earnings. Delta has delivered outsized returns for shareholders who invested over the last four to five years, and the trend continues. Delta has no Boeing 737 MAX in its fleet. It may benefit significantly, in the short and long term, from groundings of and passenger apprehension toward the 737 MAX. The only way an investor can realize a return from an investment in shares is through receipt of dividends and/or gains on sales. I repeat - the only way. If analyst consensus estimates for Delta are close, further share price gains are likely. Despite recent share price increases, strong returns are still likely buying at today's share price levels. At the time of publication of the January article on my Seeking Alpha Marketplace, "Analysts' Corner," Delta's share price was $47.69. At time of publication on Seeking Alpha, the share price had increased to $50.27. At market close on Friday April 12, Delta share price had further increased to $58.05, ~22% above when Analysts' Corner initiated coverage. But, even at the higher current share price level, Delta still offers the prospect of attractive returns of 10% to 13% per year. 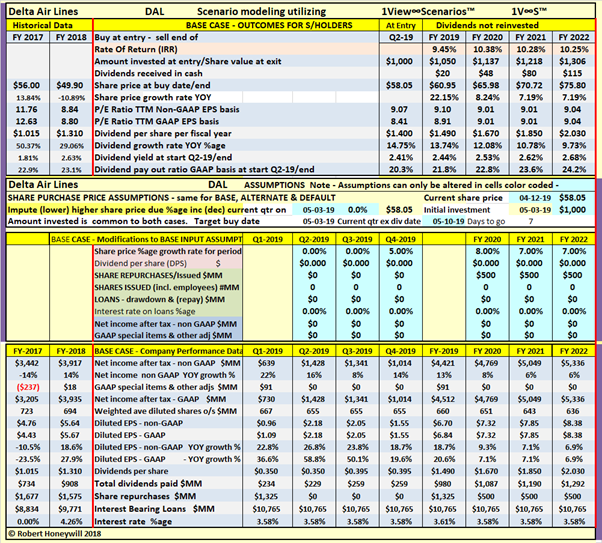 As usual, I provide the Analysts' Corner proprietary 1View∞Scenarios dashboards further below, which allow modeling of a range of qualitative data inputs, including analysts' consensus forecasts, historical P/E ratios, dividend growth rates, share repurchases, potential interest rate changes, etc., to arrive at indicative rates of return over the next three to four years. What's not included in these projections is the potential favorable impact on Delta of the Boeing 737 MAX disaster. It's an ill wind that blows nobody good. Delta has no Boeing 737 MAX in its current fleet, and none on order. It may benefit significantly, in the short and long term, from groundings of and possible passenger apprehension towards the 737 MAX operated by its airline competitors. Bombardier and Delta contend that the model it purchased does not compete with anything Boeing produces. Delta said it was "confident" Bombardier will prevail in the end because no U.S. manufacturer makes an aircraft that competes with the CS100. Fast forward to 2018, and Seattle Times reports under the heading, "In fight over Bombardier CSeries, Boeing loses friends as well as tariff case,"
The Airbus A321neo is a single-aisle, midrange plane that competes with Boeing’s 737 MAX. Delta said it will begin getting the 197-seat jets in early 2020 to replace smaller planes. I have not made any allowance in my dashboard projections for possible revenue and income benefits from the competitive advantage to Delta of not having any 737 MAX in its fleet of airplanes. ...the MAX, it represents a really small part of our industry’s market share at this point, and we’re not going to get into any specific details relative to the interline arrangements we have with some of our partners that maybe flying that product.... I would expect the numbers are not going to be material to Delta. I'm not so sure about that. Firstly, there will be passengers who will avoid the 737 MAX even after the grounding is lifted. Secondly, there are passengers who will fly Delta instead of their usual airline and may be impressed by the experience, and change their loyalties. Both of these have the potential for long-term impact. And thirdly, both American Airlines (NASDAQ:AAL) and Southwest Airlines (NYSE:LUV) have announced they are extending cancellations until August because of the 737 MAX grounding (see here). The revenue impact may be small, but it could be the icing on the cake for increased capacity utilization and margins. And from here through August covers the busy summer holiday travel period. Delta continued to show strong and increasing TTM non-GAAP earnings growth in Q1 2019. Through end of Q1 2019, Delta TTM non-GAAP earnings grew by 16% over the prior year, compared to 13.8% for Q4 2018 TTM. Comparable year-on-year TTM growth on an EPS basis was 22.8% for Q1 2019, and 18.6% for Q4 2018. The higher EPS TTM growth is due to share repurchases reducing share count. Analysts' consensus forecasts are for year-on-year growth of ~19% in 2019, followed by mid to high single digit growth in 2020 and 2021. Delta's share price growth was negligible, from end of 2014 when it was $49.19, through to January 2019 when it was $50.27, at the time of publication of my previous article in January. Since then Delta's share price has grown by ~22%% to $58.05 on April 12. This recent share price increase has resulted in significant gains for short-, medium- and long-term investors in Delta. The question for investors is whether the projected earnings growth will be sufficient to continue to drive share price increases to provide a satisfactory return over the next few years. Because the only way an investor can realize a return from an investment in shares is through receipt of dividends and gains on sales of shares. I repeat — the only way. Analysts' Corner proprietary 1View∞Scenarios dashboards are used to assess what investors in Delta can reasonably expect to enjoy in the way of returns in the future, compared to those available over the last six years. Using analysts estimates available through SA Essential and Nasdaq (Zacks research) and company guidance, we find there's a likelihood of attractive returns in the future, even at the current higher share price levels. What I need to do now is undertake the process of determining whether a purchase of Delta shares at current prevailing prices is likely to provide an acceptable rate of return going forward. This process requires a look at the past, and quantification of a range of future expectations for Delta. table 1 below summarizes a sampling of results from investing in Delta over the last four to five years and exiting at the current share price. For many stocks where I create a table similar to table 1 above, I find a wide range of returns, indicating a degree of volatility and risk. 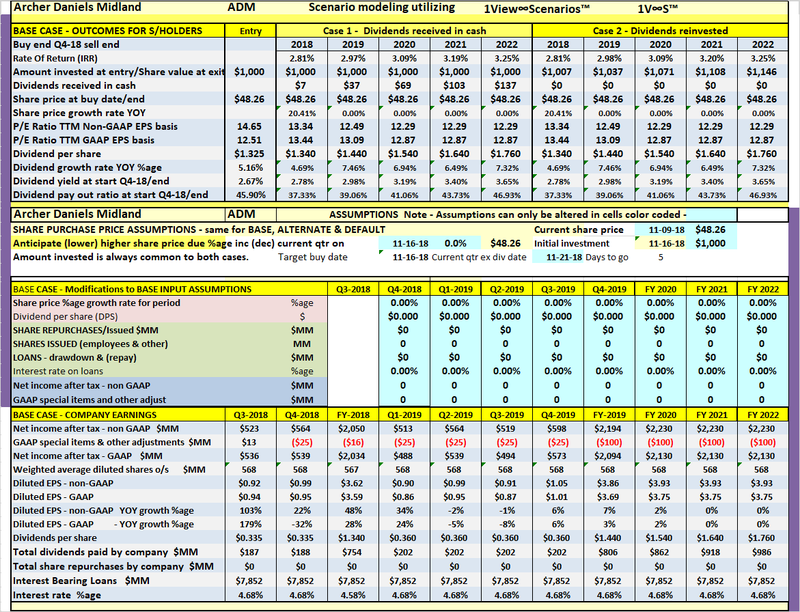 table 1 above shows the results for Delta were all positive for seven different investors, each investing $3,000 over the last four years, Average yearly rates of return range from 5.50% for investor A to 19.62% for investor D. These are not just hypothetical results, they are very real results for anyone who purchased shares on the various dates and held through to April 12, 2019. Table 1 shows a fairly stagnant share price from 2014 to early 2019. Most of the growth in share price has come over the last month or so. This has benefited all investors who have bought over the last four to five years up until when the share price began to climb steeply. This recent share price performance is not a guarantee of future performance. Whether now is an opportune time to enter an investment in Delta shares is examined in detail below. My proprietary dashboards (see further below) allow an investor to project similar data to that contained in table 1 and conduct an infinite amount of scenario testing to see what returns might be available from an investment in Delta shares at today's price levels. I believe this quantitative approach is far superior to using Betas, forward P/E ratios, PEG ratios and other indicators to qualitatively review the prospects for an investment in shares. I feed analysts forecasts into my dashboards as part of the process of converting available qualitative data into projected rates of return. The nature of this forecast data leads to analyst quarterly consensus forecasts not adding up to analyst full-year consensus forecasts. Some moderation is required as shown in table 2 below. Where the analyst weighted average consensus forecasts do not add to the equivalent full-year EPS, the quarterly EPS is adjusted per the "Adopt" column. Also, for 2022 there's only one analyst providing a forecast. This analyst is obviously very enthusiastic about Delta's prospects, without any other analysts' forecasts to moderate the consensus result. I hope they are right in their 2022 estimate. But, for the sake of conservatism I have arbitrarily reduced their $9.80 EPS to $8.00 for my projections. The EPS amounts per the "Adopt" column in TABLE 2 above have been used in the Dashboard Base projections further below. In addition, increases to the quarterly dividend rate have been input, effective in the third quarter of each year. Rates of increase assumed are $0.045 in the third quarter for all years 2019 to 2022. 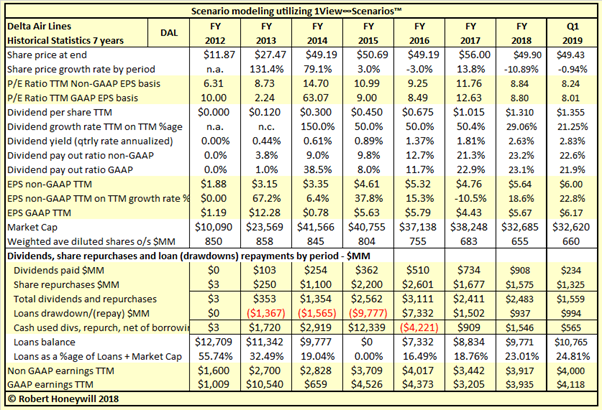 TABLE 3 below summarizes various historical financial data for Delta for purposes of comparison when assessing the reasonableness of the dashboard projections. From various data inputs the historical financial data summary per table 3 below is auto generated. Non-GAAP Earnings - The historical summary for Delta shows strong TTM non-GAAP earnings growth from 2012 through Q1-2019. Non-GAAP EPS grew at a much stronger rate due to share repurchases. Distributions Vs. Earnings - During the last seven years to end of 2018, dividend payments totaled $2.9 billion, and share repurchases $9.4 billion, to give a combined total distribution of $12.3 billion. This $12.3 billion distribution compares to total non-GAAP earnings of $22.2 billion over the same period. Share Repurchases And Borrowings - Due to the repurchases, share count came down by 477MM, from 3,076MM at end of 2012 to 2,599MM at end of 2018. Over the same period borrowings were reduced by $2.9 billion, from $12.7 billion at the end of 2012 to $$9.8 billion at the end of 2018. Loans (debt) as a percentage of debt plus equity (market cap) reduced from 55.74% at end of 2012 to 23.01% at the end of 2018. Borrowings were increased by $1.0 billion in Q1-2019, for the purpose of accelerating planned FY 2019 share repurchases. Shares were repurchased at an average price of ~$51, well below the current price of $58.09, a good outcome for the company, and its continuing shareholders. We are now in a position to review the auto-generated projected financial summaries. The first of these is our table 4 Base projection dashboard which incorporates the projected data included in our input. These dashboards are similar in form and content to table 3 and include rate of return projections. The table 4 Dashboard 1 is designed to allow us to create and modify a Base forecast by manipulating inputs and seeing the resulting effect on rate of return, share price, P/E ratio and other meaningful statistics. When we believe we have created a suitable Base scenario we can then move to the table 5 dashboard which allows us to interactively vary input, and simultaneously see the effect on rate of return and other KPIs compared to the Base forecast. Share price and purchase date - I'm assuming shares will be able to be purchased, on or before May 3, at $58.05, the same as the closing price of April 12. As the estimated second quarter ex-div date is May 10, buying by May 3 will mean eligibility for that dividend payment. P/E ratio - I have made adjustments to the P/E ratio before adopting as my Base projection. To do this, I have input percentage increases for the assumptions line item, "Share price percentage growth rate for period." The effect of these share price increases is to bring the non-GAAP P/E ratio to around 9.0 for 2019 to 2022 . From table 3, we can calculate for the years 2012 to 2018 the non-GAAP P/E ratio at year end averaged 10.08. On this basis, a target P/E ratio of 9.0 is likely conservative. Share repurchases - A conservative $500MM per year has been assumed for share repurchases in FY 2020 to 2022. Delta already expended $1.325 billion on share repurchases in Q1-2019 under an accelerated program. Rates Of Return - Based on the various assumptions the base case projects rates of return ~10% per year through the end of 2022. Dividends - Based on quarterly dividends increasing by $0.045 in Q3 each year, dividend growth will be above or close to 10% per year throughout the projection period. 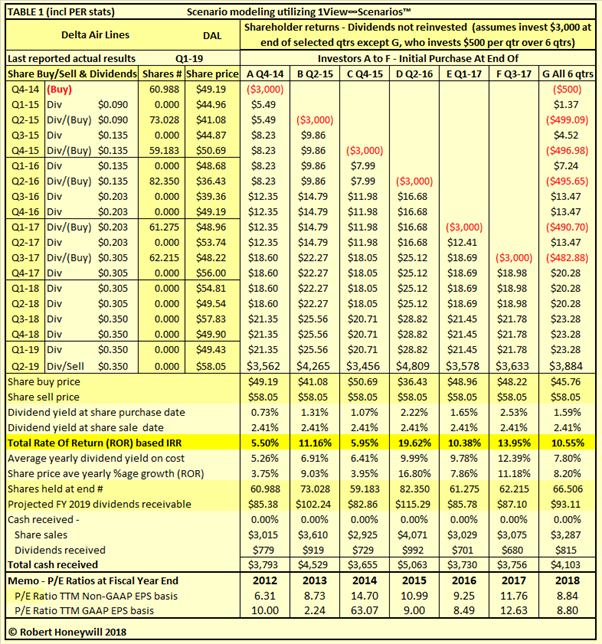 Dividend yield is projected to be ~2.4 to 2.6%. Dividend payout ratio is projected to increase from 23.1% at the end of 2018 to 24.2% at the end of 2022. We can now go to our "Dashboard 2 Base And Alternative Projections" to conduct alternative scenario testing. I'm assuming shares will be able to be purchased on or before May 31, at $58.05, the same as the closing price of April 12. As the estimated second quarter ex-div date is May 10, buying around May 31 will mean ineligibility for that dividend payment. Share repurchases increased by $500MM per year over the base projection to a total of $1 billion per year for 2020 to 2022. Average interest rate on borrowings increases by 1 percentage point at beginning of 2020. 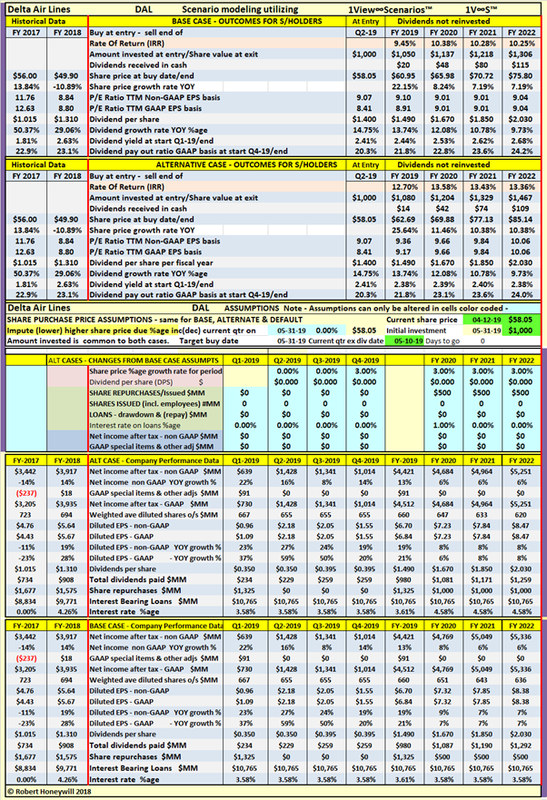 Non-GAAP and GAAP earnings unchanged from estimates in table 2 above. Non-GAAP P/E ratio increases to the long term average P/E ratio of slightly over 10.0 by end of 2022. The effect of all of the above is to increase the projected rate of return for exits ate end of years 2019 to 2022 by ~3 percentage points, from ~10% per year for the base case, to ~13% per year for the alternative scenario. Projected dividend payout ratio remains in the low 20% range. Dividend yield reduces to ~2.4% under this alternative scenario. Of course, it's possible to construct an infinite number of scenarios by varying assumptions and instantaneously seeing the impact on dividends, dividend yield, and total rate of return. To limit the amount of information on the dashboard, I have not included a "dividends reinvested" case. But I can assure all those DGI investors who follow Seeking Alpha that the working model, available at Analysts' Corner, does provide results for the "dividends reinvested" case. As I'm fond of saying, the only way an investor can realize a return from an investment in shares is through receipt of dividends and/or gains on sales. I repeat - the only way. 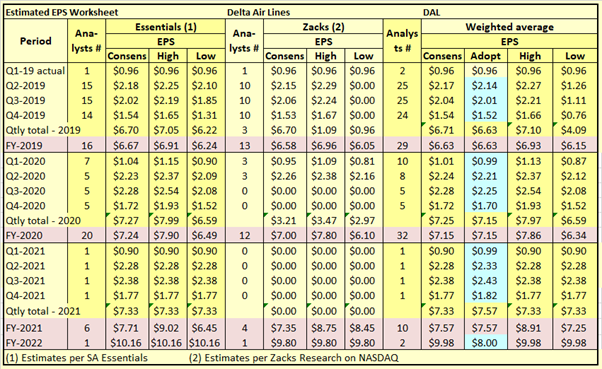 Delta has delivered in that regard, as can be seen from the historical results for investors per table 1 above. Tables 4 and 5 above suggest that Delta is likely to continue increasing dividends, and to continue to deliver solid returns into the future, even after the recent increase in the share price. It's possible to do further scenario testing using Dashboard 2 to see what buy price for Delta would meet your individual target return objectives. That does not mean the share price will come down to a lower price. But it will position you to be able to act quickly if the share price does come down. It's only by projecting the future possibilities we can get an idea of what current Delta share price level would represent a suitable entry point. Different investors will have different ROR expectations. Use of a dashboard like those pictured above enables any investor to see whether Delta represents a buying opportunity for them at the current share price, and if not, at what share price it might be of interest. If there's concern at the effect of higher interest rates than those projected above, the effect can be easily seen with one or two simple inputs to the Base/Alternative scenario dashboard. If you wish to be notified of future articles, please click "Follow" next to my name at the top of this article. Or become an Analysts' Corner member. Share investing ideas with a like-minded group. Access 1View∞Scenarios™ dashboards to allow scenario testing for tickers of interest. You are welcome to Register today for an absolutely no obligation 14-day free trial. Analysts' Corner takes advantage of market sentiment and company fundamentals, to objectively target rates of return, rather than make purely qualitative assessments based on imperfect and inappropriate data. Register now to join in the discussions on GE's involvement in the hydrogen-electrical super highway. Additional disclosure: Disclaimer: The opinions in this document are for informational and educational purposes only and should not be construed as a recommendation to buy or sell the stocks mentioned or to solicit transactions or clients. Past performance of the companies discussed may not continue and the companies may not achieve the earnings growth as predicted. The information in this document is believed to be accurate, but under no circumstances should a person act upon the information contained within. I do not recommend that anyone act upon any investment information without first consulting an investment advisor and/or a tax advisor as to the suitability of such investments for their specific situation.